The Noa Variation of Nimzo-Indian Defense. Black tries to "unpin" his Knight. Adding pressure on the beleaguered Knight at c3. Now, White's problem starts to grow. If 16. bxa5 Rxc5, 17. Qd1 Qc3+ White loses the game. Black takes advantage of the pin, threatening Rc1+, and offers the h8 Rook as a freebie. White resigns. There is no stopping Rc1 threatening mate. The Winawer Countergambit of the Slav. The Black Queen could have taken the e4-pawn, but Black decides to complicate the position. White decides to trade his Rook for the opponent's Bishop in order to ease Black's attack on the kingside. If 18....fxe6, 19. Rxf8 Kxf8, 20. Nxf6 the position favors White. White sets up a poisoned pawn. If 20....Rxe7, then 21. Be6+ (....Kh8, 22. Rxf6 gxf6, 23. Bxf6 mate) Kf8, 22. Bxf6 gxf6, 23. Qd8+ Re8, 24. Rxf6+ and mate in succeeding moves. Black cannot take White's Knight because of the threat Be6+ followed by Rf8+. Black realizes that hope is lost after 24....hxg6, 25. Nf7+ Kh7, 26. Qg5 with a mating attack. If 4. e3 Bb4+, 5. Bd2 dxe3! !, and the position would take us to a popular chess opening trick called the Lasker's Trap. Black should not be in haste to take the e5 pawn. If 6....Bxf3, 7. Bxf3 Nxe5, 8. Bxb7 and White gets compensation for the pawn. If 14....Qxe6, then 15. exd3 which solves the pawn problem. If 14....fxe6, then 15. Ne5 threatening the Queen and the g4 Bishop. Threatening both b7 and f7 squares. Black could not parry the simultaneous threats. If 17...bxa5, then 18. Rb1! with good attacking possibilities. White threatens Nc5 check with consequent mate at b7, which cannot be prevented without loss of materials. If 19....Re8, then 20. Nc5+ Kd8, 21. Nf7 mate. The Alapin Variation of Queen's Gambit Declined. Prevents 10. Nb5 ... which would be disastrous for Black. A classic attack at the opponent's flank. If 14....Kg6, Black's position would be aggravated by 15. Qg4 with a menacing pin. Black's move prevents 17. Nf4+ but White has other things in mind. Black has no choice but to accept the offered Knight. If 17....Kh6, then 18. Qh7+ Kxg5, 19. f4+ and Black would be ensnared in a mating web. If 20....Kg5, Black would be totally helpless against 21. Rf3 followed by 22. Rg3 mate. If 21. Qxf5+ Kh6, 22. Rf3 g6, 23. Rh3+ Kg7 and the King is safe. The text move threatens 22. Qh5 mate. White threatens 24. Qxg7 mate. 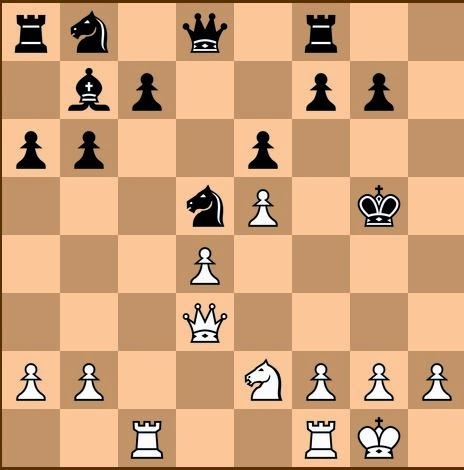 If Black protects the pawn, White still mates by 24. Qh5.